Here are some examples from a speech he gave on 4/13/2011 at George Washington University, "The Country We Believe In: Improving America’s Fiscal Future". In the examples below, the "Prepared" version comes from the "as prepared for delivery" text as I originally downloaded it from the whitehouse.gov site (which now has a transcript instead — a copy of the "as prepared for delivery" version appears to be here). The "Delivered" version is my own transcript. Prepared: This debate over budgets and deficits is about more than just numbers on a page, more than just cutting and spending. It's about the kind of future we want. It's about the kind of country we believe in. Delivered: This debate over budgets and deficits is about more than just numbers on a page, it's about more than just cutting and spending. It's about the kind of future that we want. It's about the kind of country that we believe in. Prepared: This doesn't have to be the country we leave to our children. Delivered: That doesn't have to be the country that we leave our children. Prepared: These are the kind of cuts that tell us we can't afford the America we believe in. Delivered: These are the kind of cuts that tell us we can't afford the America that I believe in, and I think you believe in. Prepared: We take responsibility for ourselves and each other; for the country we want and the future we share. Delivered: Yes, we take responsibility for ourselves, but we also take responsibility for each other; for the country we want and the future that we share. Prepared: This is the America I know. Delivered: This is the America that I know. I could cite more examples from other cases of Obama's speeches as written and as delivered, but establishing the president's specific rhetorical preferences is not what I'm after here. And I don't find these presidential that-insertions incongruous or inappropriate — the point of this post is certainly not to complain about them, or to invite others to do so. But the direction of the changes in these case was opposite to what I would have predicted, if I had thought about it. And so I wondered whether my intuition about the relative formality of that-omission was correct. Prepared: And I know there are Republicans and Democrats in Congress who want to see a balanced approach to deficit reduction. I believe we can and must come together again. Prepared: And without even looking at a poll, my finely honed political skills tell me that almost no one believes they should be paying higher taxes. Delivered: And without even looking at a poll, my finely honed political instincts tell me that almost nobody believes they should be paying higher taxes. Prepared: We have to live within our means, reduce our deficit, and get back on a path that will allow us to pay down our debt. Delivered: We have to live within our means, we have to reduce our deficit, and we have to get back on a path that will allow us to pay down our debt. Prepared: They forged historic agreements that required tough decisions made by the first President Bush and President Clinton; by Democratic Congresses and a Republican Congress. Delivered: They forged historic agreements that required tough decisions made by the first President Bush, then made by President Clinton; by Democratic Congresses and by a Republican Congress. Why has this come up? It's not because I'm moving into political science or empirical studies of rhetorical options. In order to prepare material for corpus-based research in phonetics, I've recently been doing some research on the relationship among scripts, transcripts, and recorded speeches, and President Obama's speeches are available. At some point in the future, I might be able to make comparisons with the practices of other politicians. I'd be interested in knowing whether President Obama inserts "that" in all of his speeches, or whether the that-frequency varies with the audience. Does he cut them down when he's trying to keep it real with Louis Farrakhan, for example? Or stumping among the unwashed in the interior? I would make a distinction between speaking conversationally (defining feature: live feedback from listeners) and speaking in situations that only give you one shot at saying what has to be said, with no feedback from listeners (e.g. in a formal speech (or one to a large audience), recorded message, pa announcement or voiceover). Obama is used to speaking in big venues (simultaneous interpreting may be another factor he has learned to deal with), and I think that favors a less elliptical delivery in a rhythm of bite-sized phrases, with repetition of verbs, prepositions etc. These repetitions are like little audible bullet points, reminding people that he is working on a list. This kind of delivery works better over a PA system and I think it also allows for listeners to miss a word or two without getting lost. Perhaps Obama was advised at some point to speak with simultaneous interpreters in mind. Or perhaps it's an instinctive residue of his own early non-English experiences. The latter might explain why he does it and his speech writers don't. I have long known writing teachers recommend clearing out all the excess "thats." But in my own writing, I find they help keep the reader on track, provide a cue of a coming relationship in the sentence, and generally prevent readers from having to go back over the sentence. Turn of the century writers could count on their readers to know when some words had been dropped, words implied in the structure of the rest of the sentence. When I try that these days, in my own writing, my editors tend to fill in the blanks, or I have to do it myself. Scattered "thats" are sort of like holding an elderly friend by the elbow as they negotiate uneven ground. Sigh. I would agree that a speech, while spoken, isn't informal. Putting "that" into his speeches may simply mean that he feels a need to be explicit and remove as many chances for syntactic ambiguity as possible. I've always felt President Obama strove for a more formal tone to his speeches, to sound presidential. He has a far more classical delivery style than Bush or Clinton, and I imagine Barack is deeply concerned to avoid anything that could be used to attack him for sounding Ebonical. The "thats" might be overcorrection/hypervigilance against such fears. The latter might explain why he does it and his speech writers don't. Well I suppose somebody consciously or unconsciously knows that the »remarks as prepared« are actually going to be consumed in written form. The style guide at The (London) Times encourages** us to look favourably on 'that'. I don't always agree with the guide, but in this case it seems wise – and it's affected my out-of-house writing. ** It's unusual for guide entries not to be binary yes-no. @Jason, I think Obama's pretty well clear of the charge of Ebonics by this point. He far more often faces criticism of being professorial or aloof, and I also think he's plugged in enough to know this. Mark alludes to another possibility with a the (fascinating, to me) hypothesis that Obama has a preference for clear marking of structure. This is better evidence (for me) that the man is "professorial" than the Flesch-Kincaid Reading Level BS that's usually trotted out. The structure of a lesson is exactly the kind of thing a teacher trades in. Now wait a minute. You think that the fact that Obama adds that to his speeches goes against your intuition that omitting that is less formal? Do you think presidential speeches are informal? Another way in which Obama moves in the direction of formality is to pronounce the article "a" like the name of the letter "a". I have heard him to this many times in speeches. Once in an informal setting I believe I caught him using the schwa, but I can't give a reference. Hilary Clinton uses the full "a" pronunciation in speeches, too. I think Obama uses that as a rhetorical device, and as an intensifier to break up his sentences into more easily comprehensible segments. In his speeches, as opposed to his question and answer sessions, he strives for formal exposition. My ideolect has more "that"s in than most of the ideolects around me; I have been accused of using excessive numbers of "that"s, and being very formal-sounding as a result. I spent my early years in the Chicago area, in a household with 2 NJ parents. I do not speak like anybody; I fit into no dialect boxes. No one can tell where I'm from! It may be that the extra-that's came from the Chicago dialect, and that perhaps Obama picked it there up as well. Is there a searchable corpus available that has an Illinois/Chicago subset that could be searched separately from American English in general? This may yield an interesting result! My intuition, for what it's worth, says that African American formal speaking style is more paratactic and less elliptical than corresponding white American style. Could this be a feature of the African American 'preaching' style? My own experience in African American churches and hearing many preachers and pastors makes me think that this could be a feature of that particular register. There seems to be several types of devices in President Obama's speeches that could have this same source: repetition, crescendo, intonation, etc. If you couple that with the possible Chicago/Illinois reference from Emily Viehland above, maybe that could be the winning combo. Did you include both "no one" and "no-one"? (Also, one of the interfaces to the BNC has problems with "multi-word expressions".) 97% of "nobody" in spoken BrE seems way too much to me. Could it be a prosodic thing? It seemed to me that Obama has a tendency to 'fill out' certain clauses and phrases that are paired with or otherwise connected to a longer or differently-metered clauses or phrases (in addition, I think, to the 'sign-posting' stuff mentioned earlier.) It seems like Barry has a slightly different understanding of oration than his speechwriters. Personally, I don't find "It's about the kind of country that we believe in" awkward at all when I imagine it as part of a speech to a large audience (by Obama). I think it improves the rhythm. Imagining it as part of conversational speech is another matter. I do think there it's better without that "that". Of course, the missing link here is what Obama sees on the teleprompter, which might deviate from the "remarks as prepared", as released. Any chance it's a legalese thing? Any way to search a corpus of legal briefs? "Does he cut them down when he's trying to keep it real with Louis Farrakhan, for example?" For example? You want to give an example of when he's ever been trying to keep it real with Louis Farrakhan? "Could this be a feature of the African American 'preaching' style?" Obama has no roots, none, in any African American speaking style, certainly not a preaching style. He was abandoned by his African -not African-American – father as a child and thereafter spent exactly zero time among African Americans until he was an adult. His speaking style was developed as a student at Harvard Law School and then as a lecturer at the University of Chicago Law School. Undoubtedly he consciously attempts to adopt a style less professorial than comes naturally to him, but it shows no connection to any African-American style of any sort. I personally find that while omission of "that" in very short sentences is less formal, omission of "that" in more complex clauses is somewhat more formal. It's a more sophisticated grammatical construction that requires the reader or listener to interpolate the missing connection. "I think we should go" – less formal. "I think that we should go" – more formal. Interesting post and comments. I had never noticed this hypo-ellipsis before. I am inclined to think there may be some African-American influence. But, whatever the motivation, the man can give a damn good speech. "Obama has no roots, none, in any African American speaking style, certainly not a preaching style. He was abandoned by his African -not African-American – father as a child and thereafter spent exactly zero time among African Americans until he was an adult. His speaking style was developed as a student at Harvard Law School and then as a lecturer at the University of Chicago Law School. Undoubtedly he consciously attempts to adopt a style less professorial than comes naturally to him, but it shows no connection to any African-American style of any sort." This is not correct. Up until his pastor got a bad case of foot in mouth disease on national television, he was a member of the Trinity United Church of Christ, a predominantly African-American congregation with a pronounced liberation philosophy. He had ample opportunity to learn an African-American style. I am inclined to think there may be some African-American influence. I'm inclined to suspect that someone who *looks* African-American (whether or not you think he technically is) has discovered that he has to be hypercorrect in order to be perceived as just plain correct, and that the idea of him being "too professorial" is something that has only happened *after* most of the country knows who he is, as an individual. Also, in addition to what John Roth says, as a person with some visible African ancestry (or for that matter even if he didn't have any), he may have been aware of, and influenced by, the notably famous speaking style of one Rev. King, a preacher and orator of some renown, in his day. @John Roth: "He was a member of the Trinity United Church of Christ, a predominantly African-American congregation with a pronounced liberation philosophy. He had ample opportunity to learn an African-American style." I heard 'that' he sleeps with an African-American woman as well (who can give a pretty good speech herself). I suspect that a major thing going on here is that the process of speaking — what the president does when delivering a speech — differs from the process of writing — what his speech-writers are likely doing when they prepare the speech. Speakers and writers are subject to different cognitive pressures, and different cognitive pressures give rise to different patterns of "that" usage. I/you knew (that) I/you would miss the flight. For speakers, the pattern I've seen over and over again is fewer "thats" produced when the pronouns are coreferential ("I knew (that) I…"). This is chalked up to something about easier retrieval: When the embedded subject pronoun corefers, it's easier to retrieve, so it gets mentioned earlier (thus the "that" gets left out). When I had a group of writers produce the same sentences, the opposite occurred: They produced the "that" more with coreferential pronouns. Why? I'm not sure, but my guess is that in writing, there's a wish to avoid sounding repetitious, and by sticking the "that" between the repeated pronouns, the sense of repetition is possibly diminished. Jaeger, T. F. (2010). Redundancy and reduction: Speakers manage syntactic information density. Cognitive Psychology, 61(1), 23-62. Regardless of why he's doing this, why haven't his speechwriters learned to adapt to his apparent preferences? 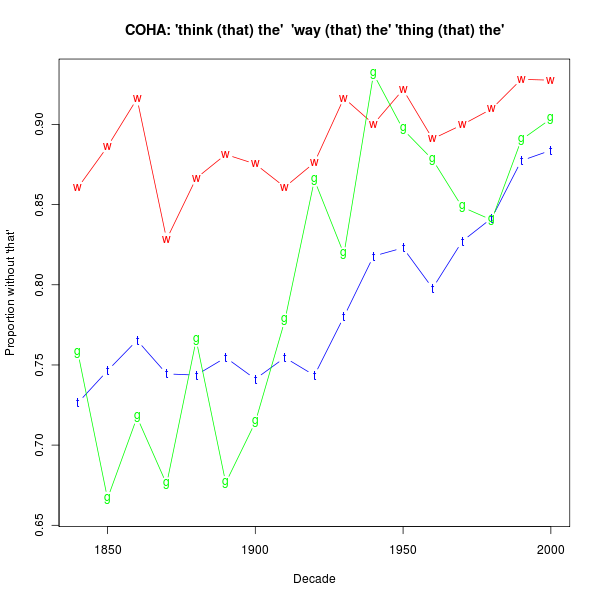 Is there any evidence that "thats" are used more frequently in any register of AAVE (including but not limited to the preacherly) than in generic AmEng? When people try, accurately or otherwise, to simulate AAVE speech patterns for comical effect, I don't think greater-than-average use of "that" is one of the standard techniques they use. I think bloix and John Roth are both mostly right, in that the President grew up with no AAVE-speakers in his family and very few in his childhood peer group. Starting when he was in his mid-twenties (well after the age at which most people's dialect in their native language is very very firmly formed, unless they wish to reinvent themselves for social-climber/chameleon reasons) he started living in a community with lots and lots of AAVE speakers and thereafter spent time commuting between social/speech situations with lots of AAVE speakers (e.g. the South Side of Chicago beyond the U of C campus) and those with very few (e.g. the U of C campus). So if he has a good ear he knows how AAVE (in the various registers found in Chicago, at least) varies from his native dialect, and perhaps could simulate it in part if he wanted to. But that's a far distance from invoking "mysterious AAVE substrate" as the default explanation for any seeming oddity of his speech. I mean, did people try to find hidden traces of a stage-Irish brogue or South Boston accent in John Kennedy's speech rather than just accepting that he was a rich kid who'd gone to Groton and Harvard under the ancien regime and had pretty much the non-stage-Irish/non-Southie dialect one would expect from that? Looking at the places he has inserted "that" it would appear to add some rhetorical emphasis. It would be interesting to hear if how he says the "that". "This is the country THAT I believe in"
Are the additional "thats" usually accompanied with an "I" or "we"? In the examples most seemed to be. Subjectively "that I" or "that we" seems stronger to me. h. s. gudnason said, "I've been taught to include the "that" in material I write that is destined to be translated." It's encouraging to hear that. I run a medical website, and am aware that many of my readers don't have English as a first language. I therefore try to write in a style that is easy to understand or translate. Using short sentences and including every "that" are among the rules I try to stick to. In my editing of medical articles, I notice that most writers regularly omit "that," even when its inclusion would facilitate the reading. An example: "The nurse should summon help as soon as she sees the elderly patient has difficulty breathing." I would think that more explicit marking of structure would be more common in complex spoken speech in order to avoid ambiguity or garden pathing. In written speech, the reader can go back if they are garden-pathed, but in spoken speech, it will just hopelessly confuse them. I've written some voiceovers, and I can tell you, even after some practice big changes get made after the first time I read the text aloud. I agree with Ellen K. The changes he is making accord with his speaking style- he is changing the speeches to have the kind of cadences and repetitions he usually has in his speeches. A sort of preacher style. The insertion of 'that' makes the rhythm much better and allows for the kind of delivery he is known for. I also think it's most likely a rhythm thing, balancing the clauses to better fit the rhythm of his speech. For instance I'll bet he had emphatic pauses in these sentences after "future" and "country" making him want an extra word in the succeeding clause for balance. It's about the kind of future…that we want. It's about the kind of country…that we believe in. The examples given all add repetition and parallel structure–they're rhetorical devices that make him sound more charismatic. Didn't he have JFK's speechwriter for a while? Same kind of cadence I think. There is a video somewhere of extremely similar speeches written by the same speechwriter, one speech given by Obama and the other by a now forgotten politician. Sounds like a different speech. I'm going to put on a different hat here and say he does it for rhythmic reasons. As a President, it's a good idea to reinforce the "nothing to worry about, everything's under control" vibe. Nicely formed prose helps to support confidence among the electorate. Obama came from a mixed background and I'm pretty sure he worked hard to get ahead. If he wanted to go into politics, I bet he studied the speeches of great political orators. Not necessarily to imitate them, but to understand the approach that they used and to develop his own voice based on the best of the oldies. Not a criticism, what better approach to take? I doubt very much whether this has anything to do with AAVE, or the speech patterns of black preachers. Part of what is interesting and confusing about this is in trying to map "thats" on a vague binary: formal and informal are loose descriptors, that don't seem to help much here. "That" often seems to work both rythmically and–I guess–ostensively. It reconnects the reader to the matter at hand, even if it remains unecessary or somewhat redundant. This would suggest to me why Obama uses it in his speeches and also why, according to your numbers, academics seem so much less inclined than others to leave it out. As a writer, when I think of leaving "that" out, it's a question of moving the language out of general use, formal or no. On the one hand, more stately and elegant literary language would elide unecessary thats. On the other, everyday colloquial talk can do without them too. I would suggest that maybe one reason why the "Fiction" category leaves out "thats" the most is because it is in the end the most "artificial" form, even if informal. I wonder–not being a linguist myself but only an appreciative lurker–how you might construct a more complex model of discursive communities that accounts for the frequency of "thats" on more than one (formal/informal) axis. To what I said earlier, I want to add, I think it relates to the slower pace of a speech in front of a large crowd, as distinct from conversational speech. And along with that, the rhythm of the speech. It fills in what would otherwise be an empty gap. So it seems to me. P.S. I really wasn't actually talking about Obama's speaking style in particular. That's why "by Obama" was in parenthesis. He just happened to be the person I was imagining saying them, when I imagined them as a part of a speech, as opposed to other spoken language contexts. My point was, even though the person whose post I was replying to might be right about "It's about the kind of country that we believe in" being awkward in speech in general, I think a speech in front of a large crowd is something very different, and it's much better with the "that". And I really wish English has different words for "speech" and "a speech", to better mark the contrast I'm talking about between a speech versus conversational speech. Wait, because someone grew up in an English speaking country and thus had no need to be "educated in English", they are like to be be incompetent and not careful about washing their hands? Way illogical. Boy, have you posted on the wrong site! It seems to me (impressionistically – no statistics) that Obama, more often than most people, will lengthen a "that" as a kind of pause-filler. I've noticed it often enough to think of it as one of his idiosyncracies (and i don't particularly like it – the rather empty 'that' is made to sound very weighty). But that's probably in spontaneous speech rather than in reading a speech. And maybe he does it more when 'that' introduces a complement clause than when it's introducing a relative clause. So that's sort of on the 'rhythm' side, except hesitation/filler phenomena aren't just straigth rhythm. There's just one problem, Jimbino: you haven't instanced an incorrect use of a preposition yet. Jimbino: Who or what is the ultimate authority on all forms of English? "you are judged by the words you use"
Are you sure that "by" is the best preposition to use here? John Roth – Obama first attended Trinity Church when he was 27 years old. You may want to say that this gives him "roots" in the black church. I don't think so. In any event, he has absolutely no trace of the African American preacher style in his public speaking – not in emotional tone, not in grammar, not in allusion, not in physical gesture, not in rhythm or pace, not in variation of volume, not in pronunciation. Nothing, none, nil. Oh, yes- he does happen to be black. Anything else you got? "Up until his pastor got a bad case of foot in mouth disease on national television"
Puh-lease. Take this to some birther site where you can write long posts about how he's Kenyan and Indonesian and Muslim and Christian and socialist all at the same time. Peezy said: "Could this be a feature of the African American 'preaching' style? […] There seems to be several types of devices in President Obama's speeches that could have this same source: repetition, crescendo, intonation, etc." Its pretty hard to imagine any effective public speaking style that addressed big audiences *without* using repetition or crescendo. Or any speaking at all that used no intonation. @Pflaumbaum, your examples are all of policy details. Obama's detractors will be happy to tell you that Obama is not a policy wonk and does better with a teleprompter and grand concepts like Hope and Change. Perhaps he is trying to simplify policy explanation so his listeners' eyes (and his) don't glaze over. Chill, seriously. There was no birther (or Muslim, or Socialist) rant in any of the comments, and since I made the first comment about AA preaching style, allow me to explain what I meant. I was thinking more of MLK's public speeches rather than Jeremiah Wright's sermons. WIthin the church, you are absolutely correct, the crescendo, accentual phrases, repetition etc. that are used are not found in the POTUS' speech. However, speeches by prominent AA preachers, such as the aforementioned MLK, Jesse Jackson, among many others, do use such features but on a more limited scale, and in a more constrained style. If you look at the prosodic markers, you will see similarities. Are they the exact same? No, but no two speakers, even of the same style, are. Think of the repetition of 'I have a dream' of MLK and the repetition of 'It's the answer' (in his victory speech) by the POTUS, or the intonation of 'I have a dream today' as compared to Obama's 'Race Speech'. There are similarities. True, and that is a good point that must be considered. I still think that there are influences, and you can see my explanation above. The first time I heard the Reverend Jackson speak (to a mixed crowd of university employees, students, and Operation Push members), he started out speaking in a normal, educated manner in what sounded to me like AmE and was completely ignored by the crowd. Then he started in with the call and response in AAVE and he had them in the palm of his hand. I suspect the audience plays a huge part in politicians' speaking technique and the AxelRoves of this world know how to fine-tune a skilled speaker for whatever demographics they're after.